Straightneck types -- yellow bottle shaped with straight necks. Crookneck types -- yellow bottle shaped with curved necks. Scallop types -- flattened and ridged around edge and may be white, green or striped. Zucchini and Cocozelle -- vegetable marrows introduced from Italy; green and yellow types are available; green, cylindrical 'Zucchini' are the most popular. Crookneck varieties are more difficult to pack than straightneck varieties and are easily broken at the neck during harvest. Although production information for all types is presented here, the straightneck and zucchini types are most widely grown for commercial markets. Squash is a warm-season crop. It should not be planted until danger of frost is past. Optimum soil temperature for germination is about 85°F and little or no germination occurs below 60°F. Growers often plant before optimum temperatures are obtained in order to get an early harvest. The use of plastic mulch, row covers, row orientation, and/or transplants can be utilized to overcome the cold-temperature conditions and produce an earlier crop. Well-drained, sandy loams with high organic-matter content and a pH of 6.0 to 6.5 are the most productive. For early crops, a lighter soil that warms rapidly should be chosen. Avoid low, poorly drained soils on which waterlogged conditions are likely to occur. To reduce the likelihood of soil-borne diseases, plant on soils that have not had squash, cucumbers, watermelons or cantaloupes for at least three years. Fall plowing is desirable to eliminate plant debris and residues in which disease and insects overwinter. In the spring, prior to planting, disk thoroughly. Plant on raised beds 5 to 8 inches high, depending on soil drainage. Rows should be prepared 7 to 10 days in advance and bed formed at planting. Bed forming will improve the uniformity of the seed bed, thus resulting in more uniform plant stands. Cultivar selection may depend on buyer preference and adaptability to area. Growers producing in the fall may need to use a precocious yellow gene cultivar or a virus-resistant/tolerant cultivar (Fig. 1). This can be essential for economic fall production. Cougar -- smooth, well-proportioned neck to bulb, yellow hybrid, slight notch at stem end; "precocious yellow gene"; 40 to 45 days to harvest. Enterprise -- shiny, light yellow hybrid; smooth glossy skin; light green stem; short stem with long tapered bulbous end; 40 to 45 days after harvest. Fortune -- smooth, bright yellow hybrid; "precocious yellow gene"; average stem to bulb proportion; 40 to 45 days until harvest. Goldbar -- very straight, uniform, golden yellow hybrid; easy to harvest; 47 to 50 days to harvest. Lemon Drop L -- creamy yellow hybrid; smooth glossy skin; early; 41 days to harvest. Liberator III -- creamy yellow hybrid; smooth glossy skin, early; Transgenic resistant to cucumber mosaic virus, watermelon mosaic virus and zucchini yellow mosaic virus; 40to 45 days after harvest. Lioness -- shiny, light yellow hybrid; smooth glossy skin; green stem with tapered end; Resistance to cucumber mosaic, papaya ringspot, watermelon, and zucchini yellow mosaic viruses; very vigorous plant; 45 to 50 days to harvest. Multipik -- yellow hybrid; "precocious yellow gene;" very prolific fruit set which may reduce fruit size and become too small under cool growing conditions; 50 days to harvest. Seneca Prolific -- creamy, yellow hybrid; high yielding; shape and color are very uniform; 47 to 50 days to harvest. Superpik -- yellow hybrid; "precocious yellow gene"; long fruit; 50 days to harvest. Destiny II -- yellow hybrid; transgenic with cucumber mosaic and watermelon mosaic virus resistance; 40 to 45 days to harvest. Dixie -- leading bright yellow crookneck hybrid; early; yields well; 40 to 45 days to harvest. Gentry -- semi-crookneck, shiny, yellow hybrid; smooth glossy skin; short length handle with large bulbous end neck; small stem scar; 42 to 46 days after harvest. Prelude II -- smooth, dull yellow hybrid; green stem, average handle-length to bulb-size proportion; skinny, refined handle; transgenic with cucumber and watermelon mosaic virus resistance; 42 to 46 days to harvest. Supersett -- yellow, semi-crookneck; "precocious yellow gene"; 50 days to harvest. Early White Bush -- most popular, scalloped type variety; flattened, uniformly white with a tinge of green; 47 days to harvest. Peter Pan -- excellent quality hybrid; good yield; light green; 52 days to harvest. Elite -- dark-green hybrid; uniform color, shape and length; 47 to 50 days to harvest. Senator -- hybrid; cylindrical fruit 5 to 7 inches long; early; glossy medium green; 40 to 45 days to harvest. Spineless Beauty -- hybrid; cylindrical, medium-dark green, spineless stems; tendency to be short on first pick; 43 days to harvest. Note: Certain cultivars contain the precocious yellow gene, which results in clear yellow stems rather than traditional green stems. Cultivars with the precocious yellow gene will also retain their normal yellow coloring longer when infected with some virus(es) (precocious yellow stem types noted above). In addition to those cultivars containing the precocious yellow gene, improved disease-resistant squash cultivars are being developed in the laboratory by inserting genes with virus resistance. 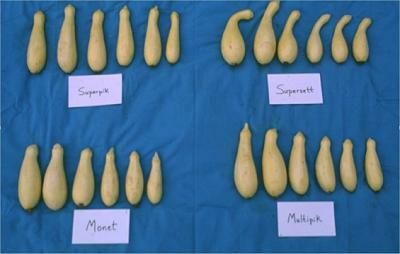 These virus-resistant (transgenic) varieties have been available to growers since the mid-1990s and may permit fall squash production in areas where viruses have been particularly troublesome. Figure 1. Shown from left to right. Yellow stem of squash with precocious yellow gene, stem which is light green, green stem which contain no precocious yellow gene. Cultivars which contain the precocious yellow gene will sometime mask virus symptoms. Figure 2. 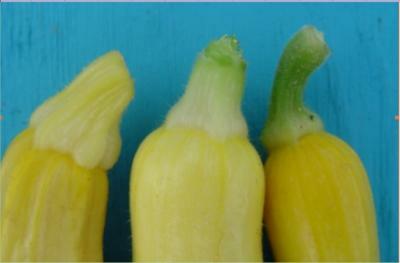 Examples of straightneck yellow summer squash (Superpik, Monet and Multipik) and semi-crookneck squash (Supersett). Figure 3. 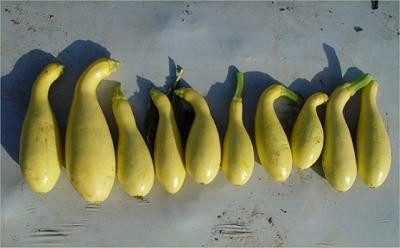 Examples of crookneck yellow summer squash. Follow recommendations from soil test report. On most soils, 60 to 80 lb each of nitrogen, phosphorus and potassium will be sufficient. At planting, one-half of the fertilizer should be banded 3 inches deep and 3 inches to the side of the seed. Sidedress with 30 to 40 lb of nitrogen when 8 to 10 inches high (3 to 4 weeks after planting). Note: One should not band more than 30 lb of nitrogen per acre per application to avoid root burning. Plant seed 1 to 11⁄2 inches deep in rows 36 to 48 inches wide. Establish final stand by thinning to 18 to 28 inches between plants. About 3 lb of seed are required if dribble planting one acre. Only 1 lb of seed is needed when sowing with a precision seeder. If plastic mulch is used, plant double rows per bed with plants spaced 18 by 18 inches. Make several plantings on 10- to 14-day intervals to have a continuous, long-season supply of high-quality squash. Plantings can be made up to 60 to 70 days prior to the first frost date. Black plastic mulch will often enhance earliness by 7 to 14 days. When plastic is combined with drip irrigation, yields are doubled and even tripled, compared with squash produced on soil without plastic. See HIL-33, Using Plastic and Drip Irrigation for Vegetable Production, further information about plastic mulch. Row covers also increase temperatures and results in earliness, while earliness can be further enhanced by using transplants. Only containerized transplants can be used since bareroot squash transplants will suffer too much root shock and die. Caution must be exercised in handling containerized transplants to prevent shock and stunting of the squash plant. Observe the plants closely when blooming starts to see if bees are visiting the blooms. Bees are essential for transferring pollen from male to female blooms. If bees are not readily noticeable in the field, place one strong colony per 1 to 2 acres near the field. Irrigation and pesticide application should be performed when bees are not active (late afternoon and evening). Under certain environmental conditions and with certain cultivars, female blossoms may be present and open before male blossoms. Without available pollen from male blossoms, fruit will not set. This situation will typically correct itself within a few days when male blossoms begin to open in conjunction with female blossoms. Consult the North Carolina Agricultural Chemicals Manual or your county extension agent. Cucumber beetles attack squash at all stages. Special emphasis on their control should be given during the seedling stage. The cucumber beetle also carries the disease organism that causes bacterial wilt. Fall squash, in most years, are attacked by pickle worms. Weekly insecticide sprays are necessary to control pickle worm. Root knot nematode is a serious pest and soil fumigation is often necessary. Foliage diseases, mostly powdery and downy mildews, are present in all seasons. These diseases are worse on the fall crop, requiring fungicide sprays beginning at the first sign of disease. Mosaic, a virus disease, is also serious in fall crops. This disease is best delayed by reducing aphid populations that spread the disease, using the precocious yellow gene or virus resistant cultivars. Squash plants develop rapidly and shade out many weeds. However, pigweed, lambsquarter, cocklebur, and ragweed can be especially troublesome. Effective herbicides are available, and, in most cases, would be a good investment, especially in fall crops. In cucurbit crops (watermelon, cucumber, pumpkin, melon) squash tend to be the most sensitive to herbicide injury. For optimum quality, harvest while fruits are tender and still have a shiny or glossy appearance. Actual size for harvest will depend on the market. Fruit should never have seed with hard seed coats. Quality is lost rapidly as the shiny color changes to a dull color. Under favorable growing conditions, the crop should be harvested every other day and sometimes every day. When harvesting squash, leave a short piece of the stem attached to the fruit. It is best to cut the squash from the vine. Use cotton gloves when harvesting to avoid scratching and puncturing the fruit. The first flush of summer squash to be harvested is usually the best quality. Plan to harvest a given planting only 2 to 3 weeks and then start harvesting another planting. This will keep quality at its best and will allow for a longer marketing season. Harvest crookneck and straightneck cultivars when fruits are 11⁄4 to 2 inches in diameter. Zucchini fruits should be harvested when they are 7 to 8 inches long. Scallop types are harvested when they are 3 to 4 inches in diameter. Summer squash are very tender and normally should not be stored except to accommodate holidays, weekends, etc. They can be held 3 to 4 days at 32 to 40°F and a relative humidity of 90%. Deterioration is rapid after such storage. Certain cultivars are more sensitve to chilling. Because of greater possibilities for diseases and insects, the fall crop is more difficult to produce than a spring crop. Viruses can be a major problem. In eastern North Carolina, the crop should be planted no later than August 20. For western North Carolina, planting should be complete by July 20 to August 1. A rigid control program will be necessary for both insects and diseases. Plastic coated with aluminum or white paint will help reduce virus by disorienting the aphids that spread the disease and discouraging them from landing on the squash leaves. Spraying every third day with stylet oil at 400 to 600 psi will reduce virus also.